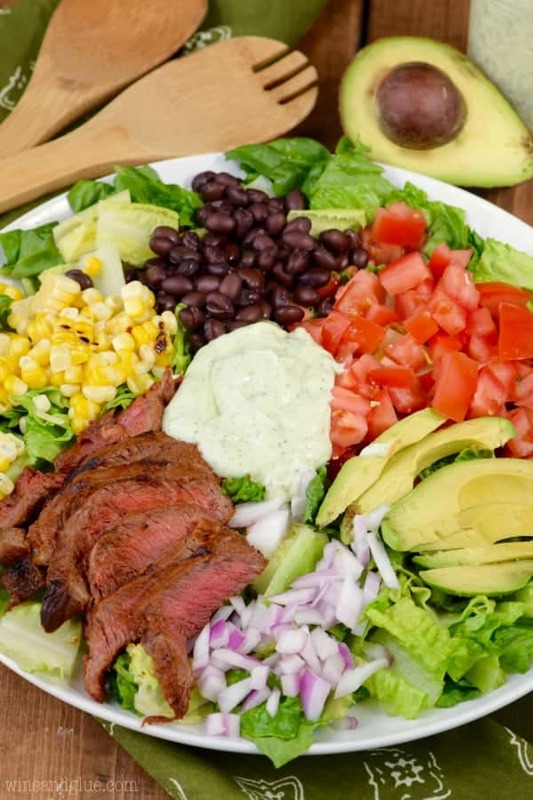 This Southwestern Steak Salad comes together in under thirty minutes with easy to find ingredients and makes for a PERFECT grilled dinner! This salad will leave you feeling totally full and satisfied. It has the perfect Jalapeño Ranch Dressing to go on top. This salad is hearty enough to make a great dinner. Just throw some chips and guacamole on the table and a big pitcher of margaritas and you are good to go! I’m so excited to be partnering with the Wisconsin Beef Council to bring you this amazing and healthy beef recipe! So it was almost two months ago that I was in Ohio with the Wisconsin Beef Council and the beef councils from Ohio, Kentucky, and Michigan learning all about beef farming, different cuts of beef, and some of the best ways to cook beef. You guys. I learned a CRAZY amount in such a short amount of time (I was literally on Ohio soil for about 24 hours). One of the things while we were there was visit a beef farm and meet this most amazing and incredibly down to earth beef farmer and his family. Did you know that 97% of beef farms in the United States are family run farms? They are passed down from generations and it is truly a labor of love. They have long and tiring days, he said that a short day was between 10 and 14 hours. And they don’t do it for the money . . . their incomes are modest at best. They do it because it is the life they truly want for themselves and their families. This family’s love for their land and their cows was so transparent. Honestly, it was so inspiring. A true story of doing what you love because you love it. No joke, talking to this farmer made me want to make beef a regular part of my family’s diet. It totally changed my perspective on the cost of beef, knowing how hard these families are working for their modest income. One of the chefs talked to us about dry cooking vs wet cooking. And today’s recipe (vs. my last beef dish) is dry cooking. You don’t use any liquids, you just use a rub. 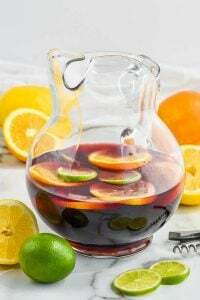 This is great to do with some more tender cuts of meat that don’t need to be marinated, like the Top Sirloin steak that I used here, or a Rib Eye. For more information on cuts of beef, go HERE. Honestly, it is such a fast and easy way to cook beef. I used a simple store bought taco seasoning packet (or you could make one from scratch). But when it comes to dry rubs, the possibilities are endless. And then you just throw it on your grill over medium heat, take it off around 145 for medium rare, and tent it before slicing in. Perfection! For tons of marinade and rub recipes, go HERE. To go along with my grilled steak and corn, I chopped up some tomato, red onion, avocado, romain lettuce and throw in some black beans. I topped it all with the most incredible and simple Jalapeño Ranch Dressing that I threw together in my blender. I made it with some herbs straight from the garden. 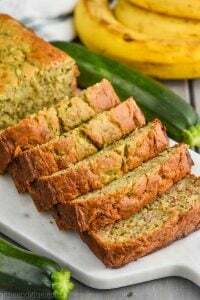 Seriously, this recipe is so perfect for summer. Though I will totally be making it in the winter too on my indoor grill. Be sure to follow the Wisconsin Beef Council on Facebook, Twitter, Instagram, and Pinterest for more recipe inspiration. 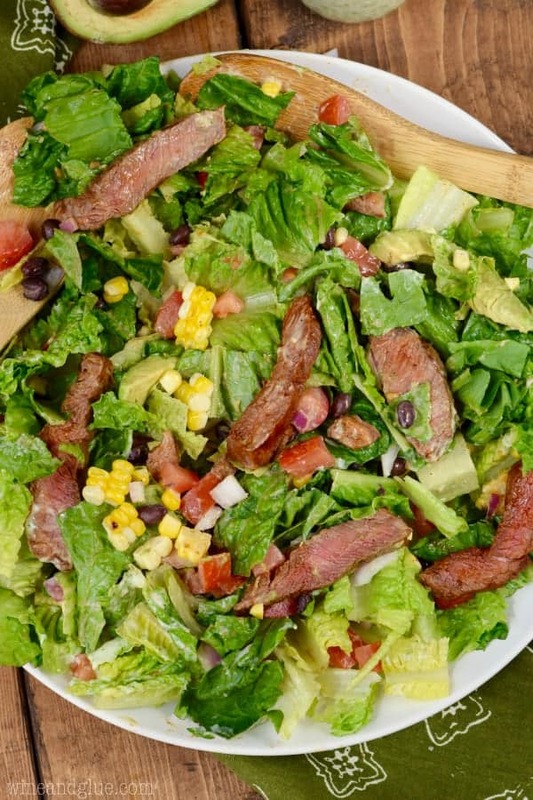 And click here for more great grilling recipes and here for more amazing steak salads! Add the garlic to the blender, and chop in blender. Add the rest of the dressing ingredients and blend until smooth, scraping down the sides intermittently to make sure it is well combined. 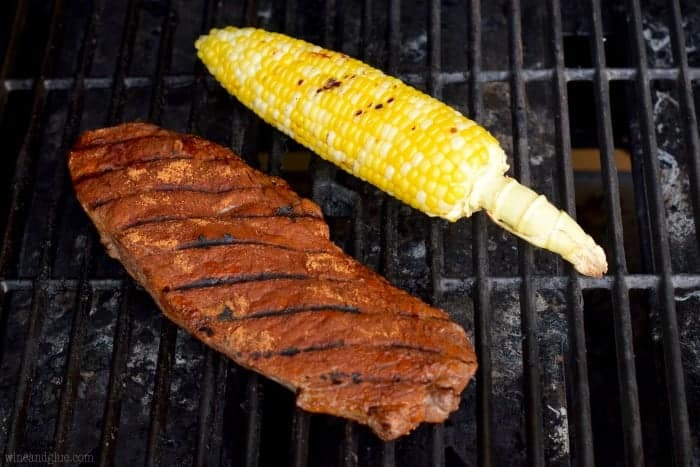 Rub the taco seasoning into both sides of the steak and remove husk from corn. Grill both over medium heat until the steak is 145 degrees (for medium rare) and the corn begins to turn bright yellow and char. Remove the steak from the grill, tent with aluminum foil for 10 minutes and then slice thin, cutting against the grain of the meat. 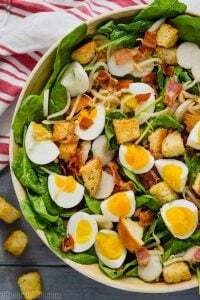 Combine with the rest of the salad ingredients and top with salad dressing to taste. This is my kind of salad! so perfevt for summer and that dressing sounds amazing! Thanks Mat! The dressing is definitely going to be a new go to! 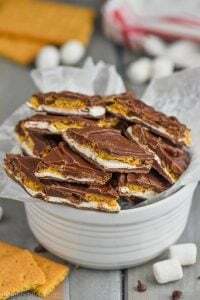 Seriously easy to make! 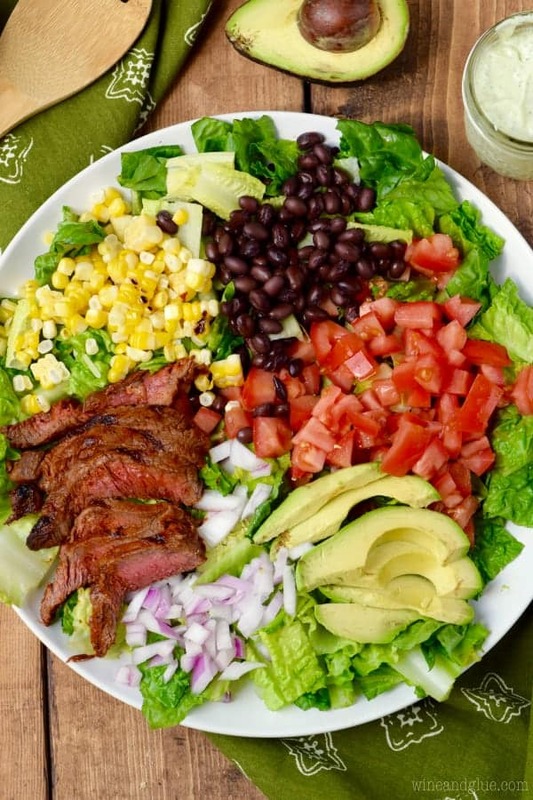 We are total beef lovers, and this salad is speaking to me!! Thanks Deborah! It was so crazy good! We’re huge beef fans here. We probably eat it 3 times a week. I could eat it every single day, quite honestly. This looks utterly delicious. 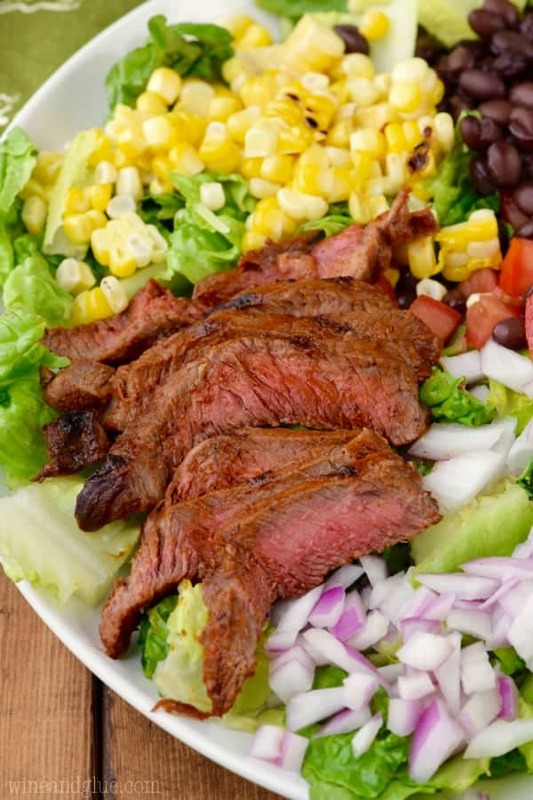 Nothing beats a steak salad. This steak salad has got my name written ALL over it! That dressing looks divine and that steak is ON POINT!